I have a couple of products here from The Body Shop's new Absinthe Purifying Hand Care line for Spring - Purifying Hand Butter and Hand Wash. The range also features a hand cream and a hand sanitizer! The packaging is simple & clean, and the fragrance is fresh and crisp, not one bit overwhelming, perfect for day and night. *Press Samples. Absinthe Purifying Hand Wash ($10)- I was expecting the handwash to be a tad drying since it is part of a purifying range. A teeny tiny bit is what you need and it lathers up to a soft foam that washes off super clean without leaving hands dry and tight - no soapy, slippery film either. I have this on my kitchen sink and it is pretty amazing when it comes to neutralizing odors. There's a subtle scent that is left behind, unlike many hand washes that claim to cut through odors and instead leave an extremely strong fragrance behind to mask it. Ingredients : Aqua/Water (Solvent/Diluent), Sodium Laureth Sulfate (Surfactant), Lauryl Betaine (Surfactant), Glycerin (Humectant), Sodium Chloride (Viscosity Modifier), Parfum/Fragrance (Fragrance), Sodium Benzoate (Preservative), Salicylic Acid (Preservative/Hair Conditioner), Linalool (Fragrance Ingredient), Aloe Barbadensis Leaf Juice (Skin Conditioning Agent), Disodium EDTA (Chelating Agent), Butylene Glycol (Humectant), Artemisia Absinthium Extract (Skin Conditioning Agent), Limonene (Fragrance Ingredient), Citric Acid (pH Adjuster), Sodium Hydroxide (pH Adjuster), CI 19140/Yellow 5 (Colour), CI 42090/Blue 1 (Colour). Absinthe Purifying Hand Butter ($20) - The hand butter is more of a thick hand cream, infused with natural Absinthe extract and community fair trade Shea Butter, that I cannot rave enough about. I have no idea as to how to judge if it does purify, but I have been using it quite a lot, especially during the day as it tends to absorb extremely fast for a hand butter. There's no greasiness or tackiness and the clean, refreshing scent is probably the best part of the product. It tends to hold in moisture pretty well too, but doesn't do so much for nails or cuticles. I've used it on my elbows and knees as well and definitely recommend the hand butter as must-have item from the Absinthe Hand Care line! Ingredients : Aqua/Water (Solvent/Diluent), Theobroma Cacao Seed Butter/Theobroma Cacao (Cocoa) Seed Butter (Emollient), Butyrospermum Parkii/Butyrospermum Parkii (Shea Butter) (Skin-Conditioning Agent/Emollient), Glycerin (Humectant), Cetearyl Alcohol (Emulsifier), Glyceryl Stearate (Emulsifier), PEG-100 Stearate (Surfactant), C12-15 Alkyl Benzoate (Emollient), Ethylhexyl Palmitate (Skin Conditioning Agent), Cera Alba/Beeswax (Emulsifier/Emollient), Sesamum Indicum Seed Oil/Sesamum Indicum (Sesame) Seed Oil (Skin-Conditioning Agent), Bertholletia Excelsa Seed Oil (Emollient), Dimethicone (Skin Conditioning Agent), Parfum/Fragrance (Fragrance), Caprylyl Glycol (Skin Conditioning Agent), Phenoxyethanol (Preservative), Xanthan Gum (Viscosity Modifier), Butylene Glycol (Humectant), Artemisia Absinthium Extract (Skin Conditioning Agent), Linalool (Fragrance Ingredient), Butyl Methoxydibenzoylmethane (Ultraviolet Light Absorber), Disodium EDTA (Chelating Agent), Tocopherol (Antioxidant), Sodium Hydroxide (pH Adjuster), Limonene (Fragrance Ingredient), Citronellol (Fragrance Ingredient), Citric Acid (pH Adjuster), CI 19140/Yellow 5 (Colour), CI 42090/Blue 1 (Colour). 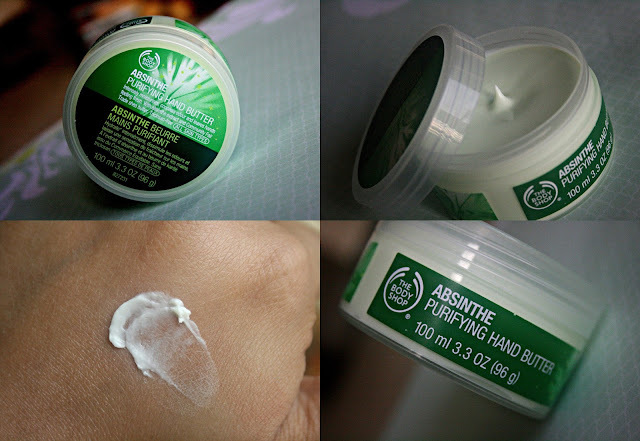 Have you tried anything from The Body Shop's Absinthe Purifying Range? Does the hand wash have pump dispenser?